Luca Pacioli is depicted demonstrating a theorem by Euclid. The table is filled with geometrical tools: Slate, chalk, compass, a dodecahedron model. A rhombicuboctahedron half-filled with water is suspended from the ceiling. This painting is attributed to Jacopo de' Barbari, 1495. Fra Luca Bartolomeo de Pacioli (sometimes Paciolo) (1445 – 1517) was an Italian mathematician, educator, and Franciscan friar. He wrote one of the earliest compendia of mathematical knowledge to be reproduced on a printing press. He popularized the system of double accounting for keeping financial records and is often known as the father of modern accounting. He was a close friend of Leonardo da Vinci. Pacioli was a man of deep faith coupled with a great love for knowledge. Compiling and summarizing the works of his contemporaries, he made their knowledge available to the broader public. His publications form a monument to Renaissance publishing and provide many facts that might otherwise have been lost to later generations. Luca Pacioli, sometimes called Lucas di Burgo, was born in Burgo San Sepolcro in Tuscany around 1445, although some commentators give a date as late as 1450. He spent his early years in Venice, but after moving to Rome in 1464, came under the influence of the artist and mathematician Piero della Francesca and the architect Leon Battista Alberti. It is from these two important Renaissance figures that Pacioli received much of his early training, particularly in geometry, algebra, painting and perspective. He remained in Rome until 1471, after which he taught in Perugia and traveled throughout Italy, often serving as a tutor for the children of wealthy families. Pacioli became a Minorite Franciscan friar in 1487, and resumed teaching at Perugia until 1791. In 1494, he published what is said to have been the first volumes in printed form on algebra and other mathematical subjects, an encyclopedic work called the Summa. He dedicated this work to his patron, Duke Guidobaldo, and in it, he praises his former teacher, Piero, whom he calls "our contemporary, and the prince of modern painting." He was again a traveling mathematics tutor until 1496, when he accepted an invitation from Lodovico Sforza (Il Moro) to work in Milan. Lodovico appointed him to the chair of arithmetic and goemetry at the University of Pavia. In Milan, Pacioli collaborated with, lived with, and taught mathematics to Leonardo da Vinci. He describes da Vinci as "the excellent painter, architect and musician, a man gifted with all the virtues." In 1497, Pacioli completed another work on geometric figures, the Divina Proportione, for which da Vinci contributed the illustrations, although it was not printed for over a decade. Da Vinci is said by Pacioli to have completed the Last Supper in 1498, while their friendship was in full force, and there is reason to believe that Pacioli's influence may have shown itself in the painting's details. The following year, Pacioli writes of a scientific contest organized by his patrons, in which several of the noted intellectuals of his time, and it may be, Pacioli himself, participated. During this period at Milan, Pacioli helped da Vinci with the calculations for a huge statue of a horse, a model of which was made but later destroyed by invading armies. Pacioli himself states that the work was 26 feet tall, and would have weighed 200,000 pounds if it had been cast into bronze. In December 1499, Pacioli and Leonardo were forced to flee Milan when Louis XII of France seized the city and drove their patron out. After that, Pacioli and Leonardo frequently traveled together, first to Mantua, then to Venice and, by the spring of 1500, to Florence, each seeking patrons and commissions. Pacioli moved to Pisa, where he taught from 1500 to 1505. He had become so well known in his field, that in 1508, at St. Bartholomew's Church in Venice, Pacioli chaired an international conference and addressed the attendees, which included diplomats, professors, physicians, poets and clerics, on the fifth book of Euclid's Elements. In 1509, Pacioli saw his work of a decade earlier, Divina Proportione, printed in Florence. He dedicated it to Gonfaloniere Pietro Soderini, who supported a number of scholars and artists, including Da Vinci and Michaelangelo. It incorporates 60 illustrations by Da Vinci during the period when the artist and the monk worked together under Sforza's patronage. It is the third book of this work, Libellus in Tres Partiales Tractatus Divisus Quinque Corporum Regularum, which is a translation of Piero's Quinque Corporibus Regularibus into Italian, and which introduced Piero della Francesca's work to a wider audience. It was, however, incorporated into the Divina Proportione without attribution, leading to the charge that Pacioli stole the work and reproduced it as his own. Little of certainty can be said of Pacioli's activities and whereabouts after this time. The last historical references to his professional activities date from 1514, when he was offered a teaching position at the University of Rome by Pope Leo X. Some commentators put the year of his death as 1517, in Sansepolcro, the town of his birth. Pacioli was a scholar of great stature, as is demonstrated by the fact that an excellent portrait of him was executed in 1495, during a period in which only notable personages were given such a privilege. 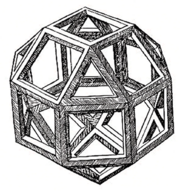 The first printed illustration of a rhombicuboctahedron, by Leonardo da Vinci, published in De divina proportione. 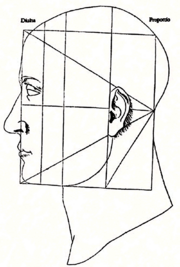 Woodcut from De divina proportione illustrating the golden ratio as applied to the human face. Summa de arithmetica, geometrica, proportioni et proportionalita (Venice 1494), a synthesis of the mathematical knowledge of his time, is also notable for including the first published description of the method of keeping accounts that Venetian merchants used during the Italian Renaissance, known as the double-entry accounting system. 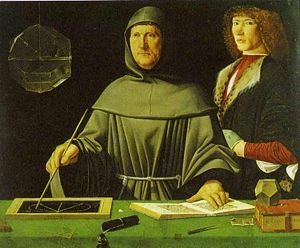 Although Pacioli codified rather than invented this system, he is widely regarded as the "Father of Accounting." The system he published included most of the accounting cycle as we know it today. He described the use of journals and ledgers, and warned that a person should not go to sleep at night until the debits equaled the credits! His ledger had accounts for assets (including receivables and inventories), liabilities, capital, income, and expenses—the account categories that are reported on an organization's balance sheet and income statement, respectively. He demonstrated year-end closing entries and proposed that a trial balance be used to prove a balanced ledger. Also, his treatise touches on a wide range of related topics from accounting ethics to cost accounting. De viribus quantitatis (Ms. Università degli Studi di Bologna, 1496–1508), a treatise on mathematics and magic. Written between 1496 and 1508 it contains the first ever reference to card tricks as well as guidance on how to juggle, eat fire and make coins dance. It is the first work to note that Da Vinci was left-handed. De viribus quantitatis is divided into three sections: mathematical problems, puzzles and tricks, and a collection of proverbs and verses. The book has been described as the "foundation of modern magic and numerical puzzles," but it was never published and sat in the archives of the University of Bologna, seen only by a small number of scholars since the Middle Ages. The book was rediscovered after David Singmaster, a mathematician, came across a reference to it in a nineteenth-century manuscript. An English translation was published for the first time in 2007. Geometry (1509), a Latin work that follows Euclid closely. De divina proportione (written in Milan in 1496–98, published in Venice in 1509). Two versions of the original manuscript are extant, one in the Biblioteca Ambrosiana in Milan, the other in the Bibliothèque Publique et Universitaire in Geneva. The subject was mathematical and artistic proportion, especially the mathematics of the golden ratio and its application in architecture. Leonardo da Vinci drew the illustrations of the regular solids in De divina proportione while he lived with and took mathematics lessons from Pacioli. Leonardo's drawings are probably the first illustrations of skeletonic solids, which allowed an easy distinction between front and back. The work also discusses the use of perspective by painters such as Piero della Francesca, Melozzo da Forlì, and Marco Palmezzano. As a side note, the "M" logo used by the Metropolitan Museum of Art in New York City is taken from De divina proportione. The third volume of Pacioli's De divina proportione was an Italian translation of Piero della Francesca's Latin writings On [the] Five Regular Solids, but it did not include an attribution to Piero. He was severely criticized for that by sixteenth-century art historian and biographer Giorgio Vasari. On the other hand, R. Emmett Taylor (1889–1956) said that Pacioli may have had nothing to do with that volume of translation, and that it may just have been appended to his work. Pacioli was one of the great compilers of his time, producing works that were summaries of the knowledge of his contemporaries. That he borrowed heavily from others to produce his works is not unprecedented among those who wish to bring the gems of knowledge to a wider audience, and certainly this was his aim. "There are three principal sins: Avarice, luxury and pride; three sorts of satisfaction for sin, fasting, almsgiving and prayer; three persons offended by sin, God, the sinner himself, and his neighbor; three witnesses in heaven, Pater, verbum, and spiritus sanctus; three degrees of penitence, contrition, confession and satisfaction…." While it is sometimes said that Pacioli offered nothing new to the sciences, his works stand as a monument to Renaissance publishing, being as they were a compendium of the significant intellectual accomplishments of his time. His life was enriched by the friendships he made with historic personages, and his writings attest to many facts that would otherwise have been lost to subsequent generations. ↑ www.ritrattopacioli.it, The Enigma of Luca Pacioli's Portrait. Retrieved December 20, 2007. ↑ Florian Cajori, A History of Mathematics (New York: The Macmillan Company, 1919), 128. ↑ 3.0 3.1 Eugene Müntz, Leonardo da Vinci, Artist, Thinker and Man of Science (London: W. Heinemann, 1898), 148. ↑ J.A. Crowe, G. B. Cavalcaselle, R. Langton Douglas, S. Arthur Strong, G. de Nicola, and Tancred Borenius, A History of Painting in Italy, Umbria, Florence and Siena, from the Second to the Sixteenth Century (London: J. Murray, 1903), 35, 285. ↑ National Gallery (Great Britain), Descriptive and Historical Catalogue of the Pictures in the National Gallery with Biographical Notices of the Painters. Foreign School (London: Her Maj. stationery office), 117. ↑ James Dennistoun, Memoirs of the Dukes of Urbino, Illustrating the Arms, Arts and Literature of Italy (London: Longman, Brown, Green and Longmans, 1851), 194-195. ↑ Giorgio Vasari, Mrs. Jonathan Foster, Edwin Howland Blashfield, Evangeline Wilbour Blashfield, and Albert A. Hopkins, Lives of Seventy of the Most Eminent Painters, Sculptors, and Architects (London: G. Bell, 1897), 387. ↑ Hugh Chisholm, Leonardo Da Vinci, The Encyclopædia Britannica a Dictionary of Arts, Sciences, Literature and General Information (New York: Encyclopædia Britannica), 448. ↑ Anonymous, Masters in Art a Series of Illustrated Monographs (Boston: Bates and Guild Co., 1905). ↑ Edward McCurdy, Leonardo da Vinci (London: G. Bell and sons, 1904), 44-46. ↑ Anonymous, The Elements of Euclid. The Dublin Review (London: C. Dolman, 1841), 11:355. ↑ Eugene Müntz and Walter Armstrong, Raphael; his Life, Works and Times (London: Chapman and Hall, 1882), 127. ↑ Peter R. Cromwell, Polyhedra (New York: Cambridge University Press, 1999, ISBN 0521664055). ↑ Jane Shoaf Turner, The Dictionary of Art (New York: Grove, 2002), 744. ↑ The Guardian, And that's renaissance magic. Retrieved December 20, 2007. ↑ W.T. Sedgwick, H. W. Tyler, and Robert Payne Bigelow, A Short History of Science (New York: Macmillan Co., 1939), 233. Bambach, Carmen. 2003. Leonardo, Left-Handed Draftsman and Writer. Retrieved December 13, 2007. New York: Metropolitan Museum of Art. Müntz, Eugène. 1898. Leonardo da Vinci, Artist, Thinker and Man of Science. London: W. Heinemann. Saporetti, Francesco. 1898. Fra Luca Paciolo; origine e sviluppo della partita doppia. Livorno: S. Belforte & Co.
Taylor, R. Emmett. 1942. No Royal Road, Luca Pacioli and his Times. Chapel Hill: University of North Carolina Press. Full Biography of Pacioli (St.Andrews). The Enigma of Luca Pacioli's Portrait. Lucas Pacioli - Catholic Encyclopedia article. This page was last modified on 2 August 2018, at 15:37.